Does anyone else feel a little let down after taking down all the holiday decor? I was in a total “funk” last week missing all my Christmas decor and just not feeling creative or inspired at all. I knew I should get started on some Valentine’s Day projects but had no motivation. Then, yesterday, my sweet husband took my boys outside to play in the snow and I had a glorious few hours of solo crafting time. 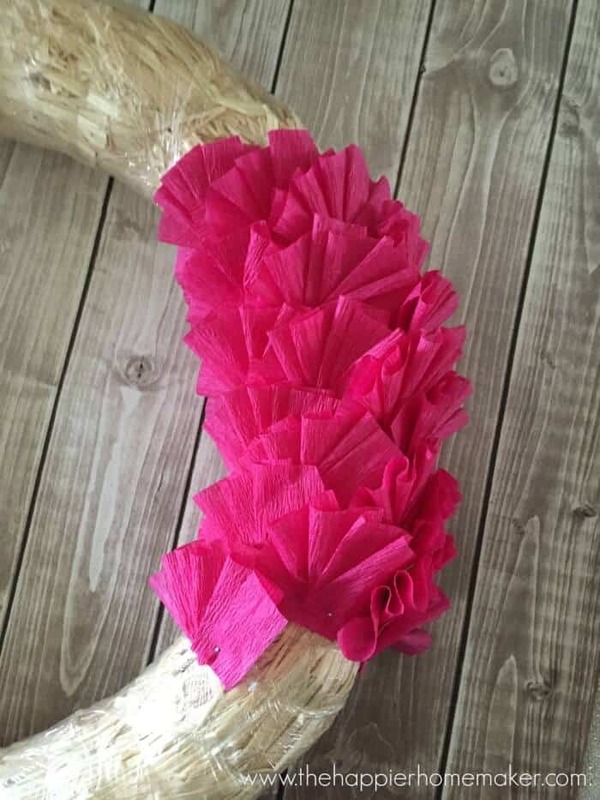 I found a roll of pink crepe paper in my office hoard and was inspired to make this cute little ruffle wreath and am head over heels in love with how it turned out! This bright pop of pink was just the thing to snap me out of my winter blues and get me pumped up for Valentine’s Day! Before you start, get comfy because it’s going to take a bit to finish the wreath-I actually took about two hours to make mine but I was making some sweet treats at the same time so I was crafting in the kitchen in spurts-it would be faster if you didn’t stop and start like I did. 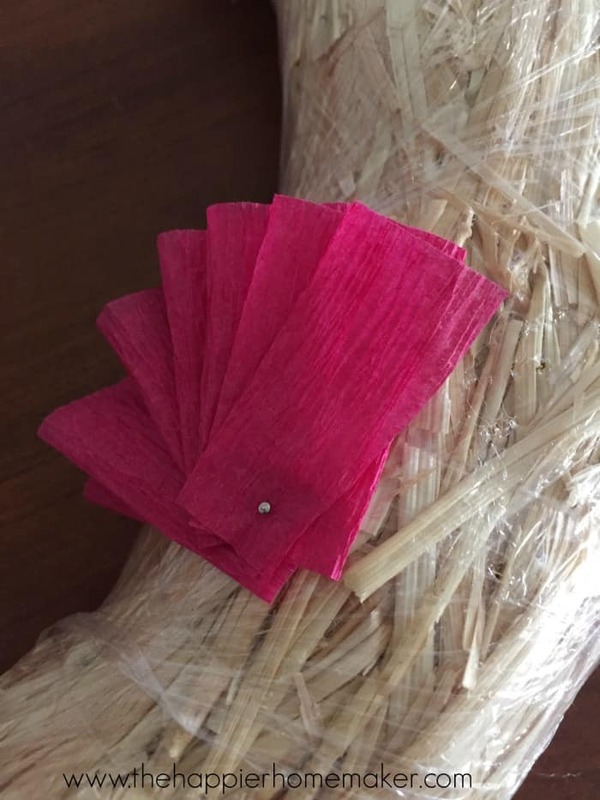 Start by cutting a pile of strips of crepe paper between 8-10 inches long. Accordion fold the crepe paper in a fan shape as you see above. 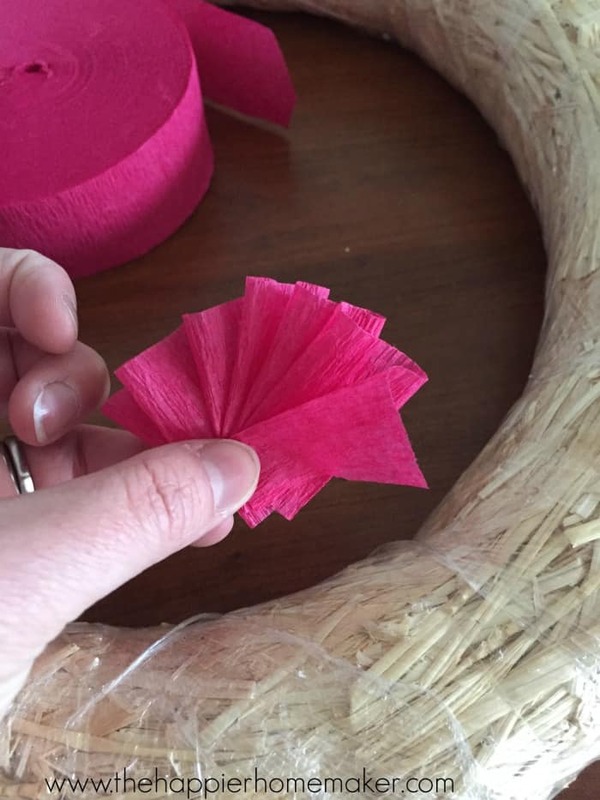 Use a straight pin to pin your crepe paper fan to the wreath form. Repeat the process, overlapping the fans to cover the pinned portions. When you get to the end of the last bit of the wreath tuck the last pieces under the first sections. 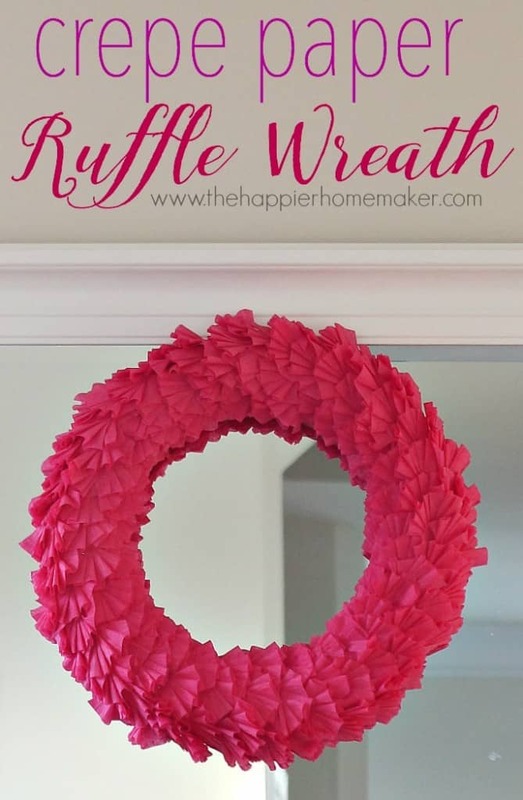 Pat yourself on the back for making such an easy and beautiful wreath! Are you inspired to start getting ready for Valentine’s Day or still mourning the holidays? Oh, and can I tell you that I love that Valentine’s Day gives this mama to 3 boys an excuse to break out the pink?! This is so cute! I know how you feel about the post Christmas let down. I am always so sad by how empty my house looks when all the decorations are put away and love to get started on Valentine’s Day right away. 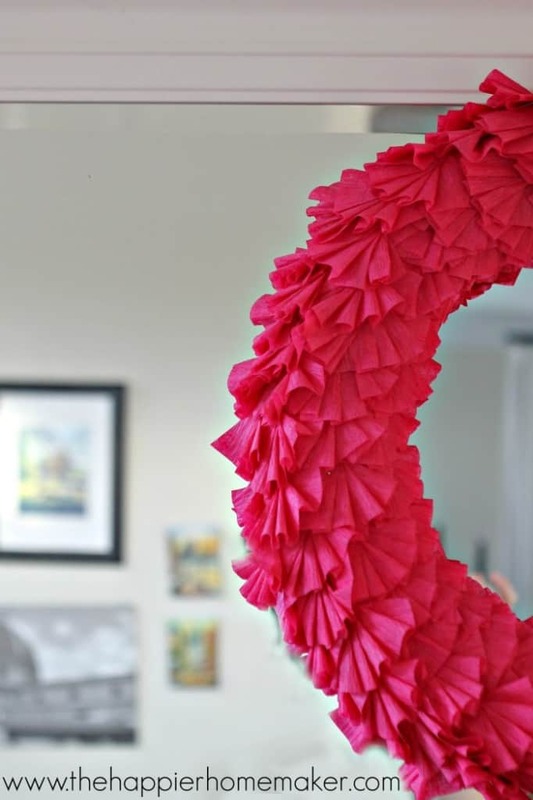 I’ve made bunches of crepe paper wreaths over the years but never with this pattern. I love yours! I LOVE that wreath, such a cute idea. I hate the look of the house when Christmas decorations are taken down. I am also the mother of 3 boys (all a lot older than yours). They tease me a lot about all the decorations I put up for Christmas but I know they expect it too. Thanks for sharing. I hate taking the Christmas decorations down, however I do feel like my house feels a little less cluttered which is nice! LOVE the new wreath….could be made for so many different occasions just by mixing up the colors! I absolutely LOVE this twist on a wreath! 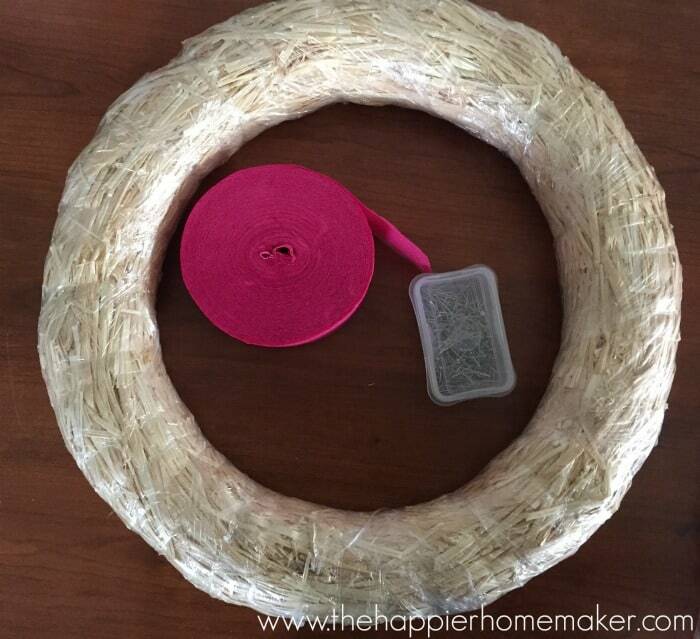 There is not a huge investment (other than a little time) and this wreath is just so fun! 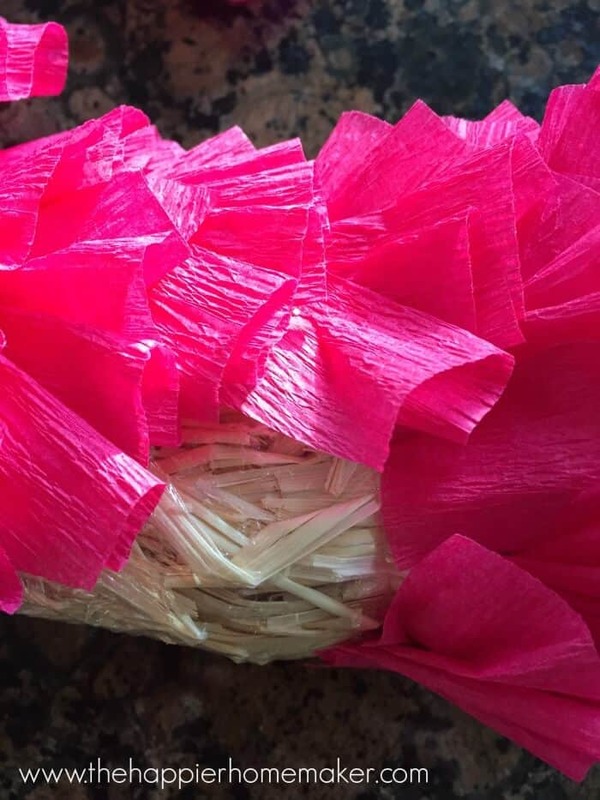 Love that ruffle technique! Oh my gosh, I love this! What a simple idea, but it turned out so cute. And it would be great for any holiday or event, love it! Pinning for sure!